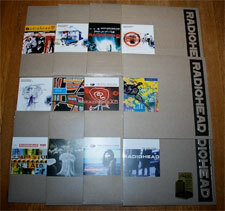 Win all of Radiohead’s EPs! We know Radiohead fans have been there from the beginning. You loved Pablo Honey as much as you dig Hail to the Thief. You have all their records, but you still want more. That’s why we’ve decided to regale one lucky winner with a package that includes all their reissued EPs! Just think about all the quality time you’ll be spending with your turn table, flipping records and finding your new favorite B-sides. So all you have to do to be entered to win this sweet prize is sign up for one (or all) of our newsletters. What are these newsletters you say? There’s our weekly update full of the newest releases, parties and events we’re involved in and the latest news on things like our Insound Studio Sessions. The vinyl newsletter, which breaks down some of our favorite releases available on the holiest of formats… VINYL! We also have an MP3 of the Week newsletter that nets you one free mp3 each week from a band that we totally love. So there really is no way to lose, you get great news on our favorite music and the chance to win a great Radiohead prize pack. How can you say no to that?